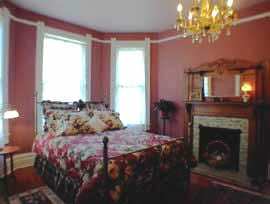 Bed and Breakfast: Come Stay With Us! It’s Where You Want to Be. offers complete privacy (with a gated entrance) as you explore the natural beauty of lush fields, fishing ponds and walking trails through the wooded area around the inn located on the 2500 acre Lightning Rod Ranch. Escape to this country getaway near Davis, Oklahoma. Pecan Valley Inn is conveniently located halfway between the Oklahoma City - Norman area and the Dallas - Forth Worth area. Amarillo, Little Rock, Tulsa, Wichita and Houston are all an easy 3-6 hour drive. The ranch is only 1-¼ miles west of I-35; close to Turner Falls Park, Lake of the Arbuckles and Chickasaw National Recreation Area in the Davis and Sulphur, Oklahoma area. Lake Murray State Park is just 25-30 minutes south over the Arbuckle Mountains to Ardmore, Oklahoma. Enjoy the seasonal outdoor activities such as picking blackberries or pecans or maybe feeding a baby calf. There are fishing ponds stocked with bass and catfish and what a spot to see the sunrise or sunset! You may be so fortunate as to see a turkey or deer while hiking through the ranch or on the walking trails in the wooded areas around the house. 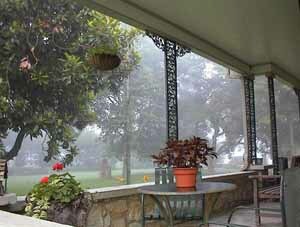 Relaxing on the wraparound porch is a favorite of the guests, sipping morning coffee and counting the hummingbirds. The hammock offers a great spot to see the stars or watch the fireflies summer evenings. Select from three romantic guestrooms or suites: one suite has a working fireplace in the bedroom with a separate sitting room, another room has an optional sitting room with a private entrance to the wraparound porch on the first floor, while the last room could have an optional second bedroom as a suite for four. Many of the suites feature original oak and Italian tile fireplace surrounds. There are original chandeliers, antique ceiling fans and light fixtures. The private baths have deep soaking claw foot bathtubs; two also have tub shower combinations. The guest rooms are named for significant persons having contributed to the ranch and farming estate or are named after a Victorian theme: Miss Laura’s Room, Dr. Howell and Miss Laura’s Suite, The Meinders Suite, Victorian Garden Room, and The Hunt Room and Victorian Garden Room Suite. The inn has architecturally maintained, historic color schemes and carefully restored design elements. The curved “bridal staircase” reminds one of the Victorian pomp and wealth to build the “mansion of the area” surprisingly found in Indian Territory prior to Oklahoma statehood. The elegant rooms are designed with your needs and comfort in mind. Enjoy the relaxing common living room with a fireplace which is an ideal reading area for reading, quiet conversation or planning a day of activities. Hearty, country breakfasts are served in the dining room or on the patio. Early risers may want to sip their coffee while sitting on the wraparound porch. Stay Friday and Saturday Nights for $40.00 off the total bill. Grab your best pals and enjoy a terrific, relaxing getaway filled with fun and great savings. This Two-Night Package is available for 2 or more couples traveling together. Click for more deals and packages. We were featured as New & Noteworthy in "Fun Times in the Arbuckles," the official publication of the Arbuckle Mountain Area Tourism Association. Pecan Valley Inn was featured as an Historic Farm and Ranch House in the book Oklahoma Homes Past and Present by Goins and Morris. "Beautifully Restored Facility with modern bath facilities - way beyond the 'average'. Breakfast - Great! "Incredible hospitality!! Magnificent home, outstanding food." "I had the most awesome time! This home is beautiful but catching the bass at sunset...was the sort of fun that I will remember my entire life." "...lovely time at your beautiful home. The breakfast was wonderful. A true taste of life in the USA."